One of the key topic areas that most CRM systems need improvement on or need extensions for is its Marketing capability. The reason for this is that there are so many different ways to market, that one system out of the box would probably never meet every organisations needs and requirements. There are many providers that can offer extensions to marketing functionality within Microsoft like Click Dimensions, Core Motives and MyCRM being just a few. Most of these can offer some social integration along with pretty much standard email marketing and tracking. 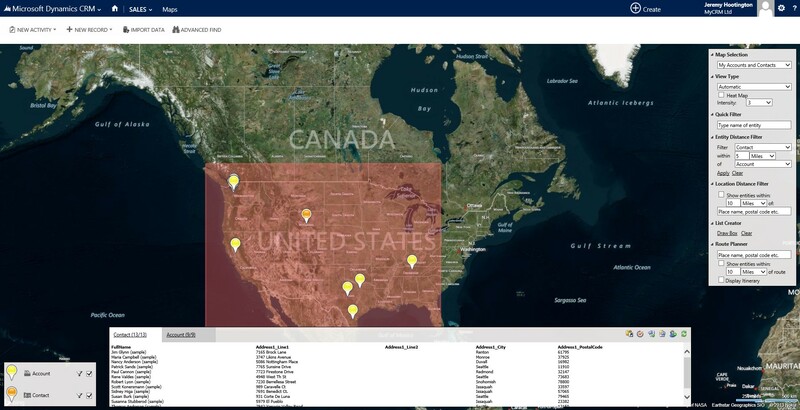 The new extended Map integration offered by MyCRM takes your marketing capability further and allows end marketing users to visualise and work with data in several ways. So you’re holding an event? So you’re holding an event and you want to invite contacts and leads in your Microsoft CRM system to the event. When assuming you don’t have Maps, all you can do is use the search capability to try and find contact in a similar area. With Maps you can highlight the area where the event is going to be held and select all the contacts on the map and then either add then to a marketing list or a quick campaign. This great feature will not only help to speed up the process of finding the right contacts, but with the ability to zoom in on a Map to highly populated areas you can invite the closest contacts as a priority, offering different incentives for those that have to travel more than 10km / miles. The other great thing about using Maps integration is that you can present Leads and Contact in views on a single map so you don’t have to repeat the process. Maps gives you as an end user a great way to drill down and focus of data, in a new way. Seeing exactly where your customers and leads are will help attendance and focusing sales effort. “medical-supermarket.com is an online one stop shop for healthcare. Providing anything from stationery and services to medical consumables. The eMap solution has allowed our field reps to work much more efficiently by searching for accounts within areas they are visiting and planning their routes. It has also allowed us to run marketing campaigns for certain regions. An invaluable tool which every company with a field presence should have. Not only is the tool up too scratch but the service behind it is brilliant, the team at MyCRM are quick to respond and always pleasant!" In our next post we will be looking at Field Sales Reps using Maps to plan effective routes and drive time. To find out more about the MyCRM product suite then please visit our app store and download centre. MyCRM has over 20 years’ experience in understanding how CRM as a technology and CRM as a process can work in business and has therefore developed a number of off-the-shelf extensions to enhance CRM productivity. As an Independent Software Vendor (ISV) we offer a range of pre-built application extensions for your Microsoft CRM Solution. You can get access to a range of products for Microsoft Dynamics CRM from the MyCRM download centre here: http://downloads.mycrmgroup.com after registering for an account.